A spell is cast during Halloween Time at the Disneyland Resort as more spooky fun expands into Disney California Adventure Park this year, from Friday, Sept. 15, through Tuesday, Oct. 31, 2017. 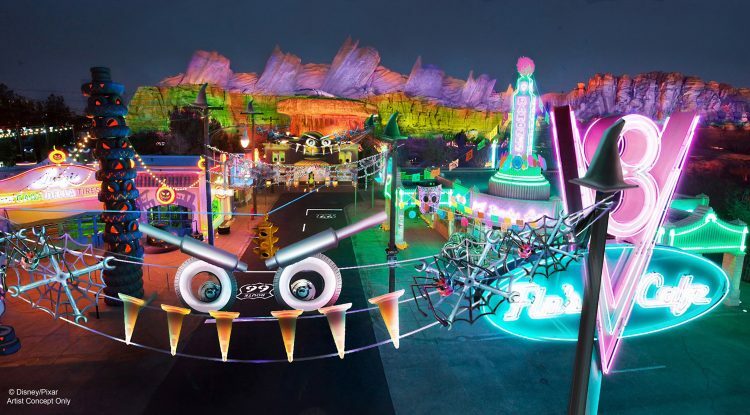 For the first time, Cars Land in Disney California Adventure will transform with a special Haul-O-Ween makeover as the citizens of Radiator Springs don Halloween costumes and decorate their respective homes for the season. Lightning McQueen, Mater, Cruz, Red and DJ will be all dressed up–as a super hero, a “van-pire,” a pirate, a clown and a punk rocker, ready to go “trunk-or-treating.” Attractions transform, too, with Mater’s Junkyard Jamboree turning spooky as the Graveyard JamBOOree, and Luigi’s Rollickin’ Roadsters getting a seasonal twist to become Luigi’s Honkin’ Haul-O-Ween. At Disneyland, guests will enjoy frightfully fun thrills on popular Halloween attractions Haunted Mansion Holiday and Space Mountain Ghost Galaxy, along with themed foods and merchandise, plus spooky décor that includes a giant Mickey Mouse jack-o’-lantern and a Pumpkin Festival on Main Street, U.S.A. Guests are invited to dress in costume for Mickey’s Halloween Party where they will trick-or-treat throughout Disneyland for candy and healthy snacks. And this year, capturing memories during the party will be easier than ever as guests who have admission to Mickey’s Halloween Party will enjoy the added bonus of unlimited Disney PhotoPass. Beginning July 24, Mickey’s Halloween Party Tickets* may be purchased by the public online and on mobile devices at http://Disneyland.com/party, as well as at the Disneyland Resort main gate and by phone at 714-781-4400 Make sure to buy your tickets early as they do sell out quick!